If your application does not use a SoftDevice, you can skip this step. If you are using a SEGGER Embedded Studio (SES) project from nRF5 SDK v14.2.0 or later, the placement of the SoftDevice is already configured correctly and you can skip this step. In SES, right-click your project and select Edit Options. 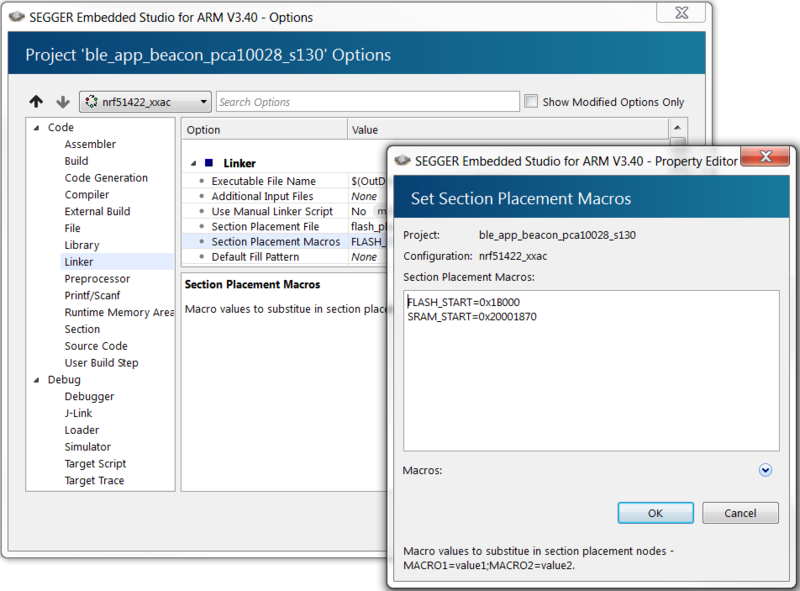 In the Section Placement Macros field, add values for FLASH_START and SRAM_START. To find the correct values, check the Keil project that you imported (in Keil µVision, select Options for Target > Target), or program the firmware with approximate values, run it, and check the log output in the debug terminal for the recommended values. Select Build > Rebuild project_target to rebuild the project. Alternatively, press ALT + F7. 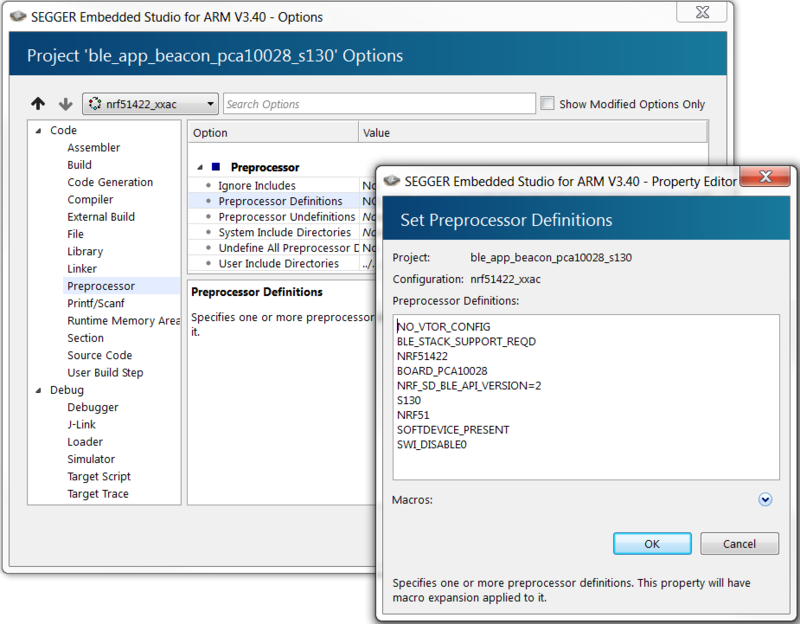 Add the definition NO_VTOR_CONFIG to the Preprocessor Definitions. This definition tells SES to expect a SoftDevice to be present that will forward exceptions and interrupts to the application. 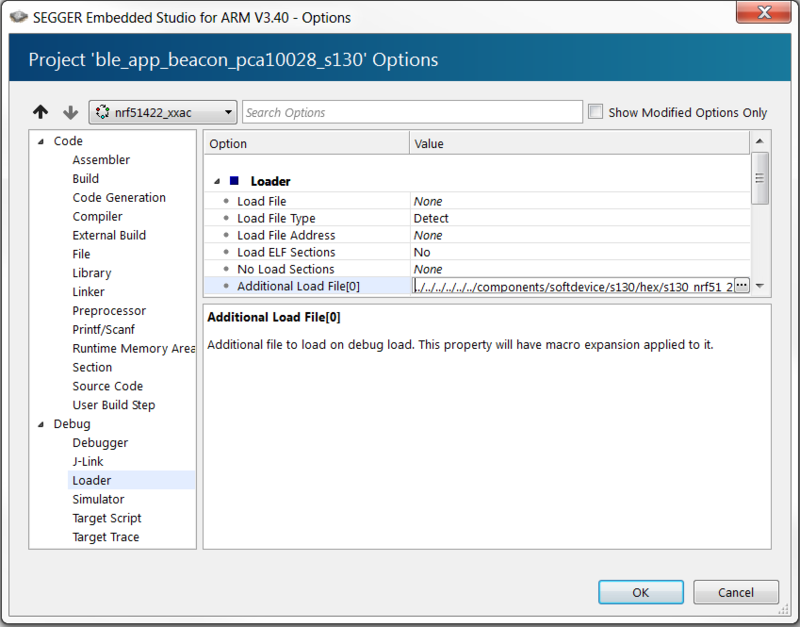 In the Debug section of the project options, select Loader. Add the absolute path to the SoftDevice to the Additional Load File field, for example, ../../../../../../components/softdevice/s130/hex/s130_nrf51_2.0.1_softdevice.hex.